Heart failure is defined as a weakness of the heart muscle. Due to the heart’s ability to fill with or eject blood effectively, cardiac output is decreased. The result is a build up of fluid in the lungs, heart, and surrounding body tissues. In this issue we will look at heart failure; the symptoms, treatments and how heart failure is managed in Hospice patients. Heart failure is defined as a weakness of the heart muscle. Due to the heart’s ability to fill with or eject blood effectively, cardiac output is decreased. The result is a buildup of fluid in the lungs, heart, and surrounding body tissues. There are a variety of conditions that can lead to heart failure. Coronary artery disease or a heart attack are some of the most common causes. Problems with heart valves, infection in the heart muscle, high blood pressure, sleep apnea, an abnormal heart rhythm, advanced age and elevated blood glucose can also damage the heart’s pumping mechanism. Other more controllable causes include smoking, being overweight, excessive alcohol consumption, and a diet high in complex carbohydrates. Heart failure can be categorized as right-sided, left-sided, systolic or diastolic. It can also be acute or chronic. Fatigue – blood flow is reserved for the vital organs first. Other areas such as the extremities can be deprived of blood. Feet Swelling – The body relies on fluid to function. In heart failure, body fluid backs up as the heart is unable to pump effectively. Because of this there is impairment of circulation. This impairment and gravity cause fluid to pool in the feet and ankles resulting in edema (swelling). Shortness of Breath – The heart and lungs are closely linked. Because of this, if something is wrong with heart the lungs are affected. Heart failure causes blood to back up in lungs which makes it harder to breathe. A decrease in blood supply means there is less blood circulating and carrying oxygen to other parts of the body. Lack of appetite – As previously stated, in heart failure circulation is impaired. The stomach requires oxygen to metabolize food. To accomplish this, strong circulation is necessary to take away metabolized nutrients. A decrease in oxygen leads to a decrease in stomach function which in turn results in a decreased appetite. Because of this, there can be an increase in indigestion and nausea. Coughing – The cough associated with heart failure is one that is very consistent. The patient can experience wheezing as well. Due to impaired circulation, fluid builds up in the lungs resulting from acute pulmonary edema. Gradually deteriorating condition – Patients with heart failure will see their condition worsen. At first the shortness of breath may be mild but with time and disease progression, shortness of breath will continue to worsen. Increased Heart Rate – In heart failure, the heart is not an effective pump. Because of the decrease in circulation and a shortage of oxygen and nutrients. The heart must work harder. This increased work load results in the heart beating faster. The patient may experience a sense of dizziness or feeling light headed especially upon standing. Sudden symptom onset – The symptoms of heart failure can develop quickly and suddenly. Patients can have little indication that they suffer from this illness state until the sudden change in condition. General Bloating – Heart failure can lead to fluid accumulation in the abdomen. This collection of fluid known as ascites can range anywhere from mild to quite severe. This is often the result of a bloating of the liver (hepatomegaly). Problems sleeping – Heart failure can make it very difficult for patients to achieve adequate sleep. Lying down can cause pressure from the fluid accumulation in the chest and abdomen. This can lead to an increase in shortness of breath. As a result, patients lack sleep, feel tired and weak and lack energy. Treatment varies based on the type of heart failure and the presenting symptoms. Some risk factors are out of the patient’s control; advancing age, irregular heart rhythm, defective heart valves. Prevention of risk factors such as smoking cessation, weight loss and increased activity can aid in symptom control. 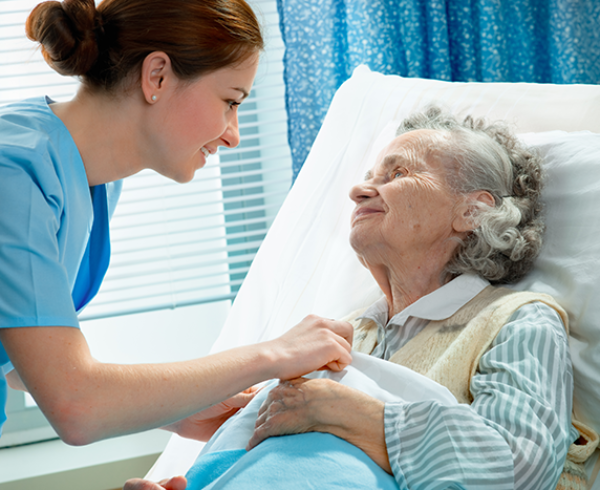 For Hospice patients, adherence to the plan of care and management of symptoms will provide comfort. Stick to the medication regimen – symptoms will only be adequately managed if medications and treatments are done as prescribed. Patient education is a must to help ensure symptom management.